On May 15, 2018, President Xi Jinping met with Prime Minister Keith Rowley of Trinidad and Tobago at the Great Hall of the People. Xi Jinping commended Prime Minister Keith Rowley and the People's National Movement of Trinidad and Tobago led by him for their important contributions to promoting the development of their relations with China for a long time. Xi Jinping stressed that China is comprehensively deepening reform and expanding opening up. While realizing its own development, China stands ready to realize common development with all countries based on the principle of extensive consultation, joint contribution and shared benefits. China remains committed to, together with all countries, promoting the building of a community with a shared future for mankind. In this historical process, China is willing to, based on the principle of mutual respect, equality, mutual benefit and common development, establish the comprehensive cooperative partnership with countries in the Caribbean region. Trinidad and Tobago is a major country in the Caribbean region and an important cooperative partner of China in the region. Both countries share similar position and views on many aspects. Under the new circumstances, both sides should make joint efforts to realize new and greater development of bilateral relations at bilateral, regional and multilateral levels. Xi Jinping emphasized that China and Trinidad and Tobago should reinforce the integration of development strategies and development plans, intensify exchanges at all levels, and deepen understanding and mutual trust. China is ready to strengthen cooperation in the “Belt and Road” construction with Trinidad and Tobago and help the country’s economic and social development. Both sides should enhance people-to-people and cultural exchanges to make bilateral friendship get deeper into the hearts of the people. China and Trinidad and Tobago should maintain close communication and coordination on climate change and other major global issues as well as the United Nations affairs, and firmly safeguard the common interests of both countries and developing countries. China will continue speaking boldly in defense of justice for Trinidad and Tobago and other Caribbean countries on multilateral occasions. It is hoped that Trinidad and Tobago will play an active role in promoting the overall cooperation between China and the Caribbean, as well as between China and Latin American countries. 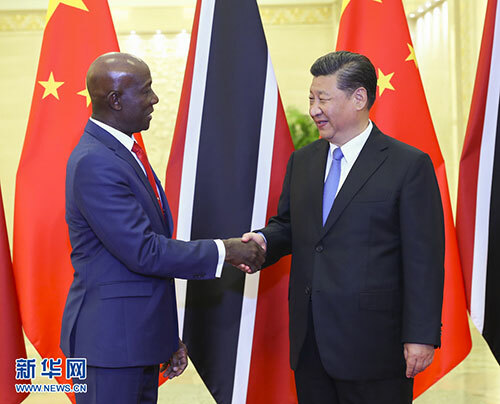 Keith Rowley expressed that President Xi Jinping’s successful visit to Trinidad and Tobago in 2013 has laid a solid foundation for the long-term development of bilateral relations, for which they still remember so far. China’s development achievements are admirable. Trinidad and Tobago also has a dream of pursuing development. All sectors in Trinidad and Tobago hope to conduct closer cooperation with China. As early as 1806, the first batch of Chinese people arrived in Trinidad and Tobago through the Maritime Silk Road. In the new period, Trinidad and Tobago stands ready to actively take part in the Belt and Road Initiative advocated by President Xi Jinping, and expand scale of bilateral economy and trade and investment as well as people-to-people and cultural exchanges, in a bid to assist in the development of relations between the Caribbean and China as well as between Latin America and China. Yang Jiechi, Wang Yi, He Lifeng and others attended the meeting.